Each year 1,100 attendees gather for Europe's largest professional event in the field of science engagement, the Ecsite Conference. Contribute to shaping future conferences: apply to become a member of the Conference Programme Committee (ACPC). The ACPC brings together science engagement experts, representatives of past, present and future conference hosts and Ecsite staff. The ACPC is in charge of the conference’s format and programme, while each year the local host takes care of social events and logistics. 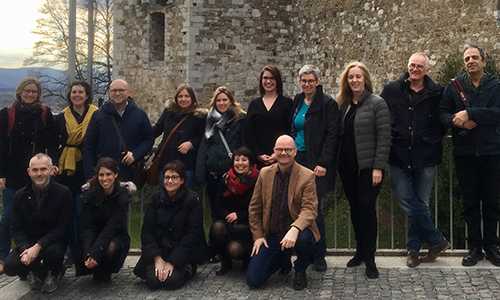 This is an exciting time to join, as the Ecsite Board invited the ACPC to join in re-thinking the conference as part of Ecsite's 30th anniversary "celebrate-reflect-act" season. Feels like something you'd like to be part of? This call is open to staff of Full Ecsite members. We would also find it interesting to recruit a member from academia, in one of the disciplines linked with science engagement or museology. Two transversal qualities are also important for Committee members: creativity and ability to build and sustain partnerships. Having a wide professional network in the science communication field can also be a plus. Overall, the Committee needs balance of expertise, geographic origins, genders, types & sizes of organisations. Take a look at the composition of the ACPC here to see how your profile could fit (note that Joanna Kalinowska and Amito Haarhuis will sadly be leaving us this autumn). ACPC members serve for a mandate of three years, renewable once. In November or early December, all received session proposals are reviewed in a three day meeting usually taking place in Brussels. In March or April members usually gather in the city of a future conference edition, for a two day meeting. During the conference itself, members attend a lunch meeting together on the conference's last day. All members have a few duties during the conference, like running evaluation interviews, presenting keynote speakers or welcoming newcomers at the Newcomers' breakfast. In September, we gather for 1.5 or 2 days and mostly discuss the previous edition's evaluation. Between meetings, Committee members' most time-consuming duty is to read and pre-rate all 100-150 received conference proposals in advance of the November meeting. They are also punctually involved in specific task forces. Members cover their own travel and accommodation expenses and unfortunately being an ACPC member does not grant you a free registration to the conference. The networking and learning are invaluable, however! Fill in this application form by 30 June. Note that one of the questions entails feedback about the 2019 Ecsite Conference: make sure you're there - and wait until after the conference to apply. Save the date: if you're selected, the first meeting you'll attend will be taking place in the first half of September (location and date will be confirmed soon). Want to know more? Email Ecsite's Communications and Events Manager Julie Becker who will put you in touch with a current member.